At the Mattress Factory, American and Egyptian artists put a fresh spin on global politics. "'Tahrir2' celebrates the use of public space as an instrument of change and a crucial indicator of democracy in action." "Africa Magazine," by Amado Al Fadni, is a group of digitally reproduced monoprints that imagine what the covers of news magazines might look like if Africa were the "first world" and the West the "third world." 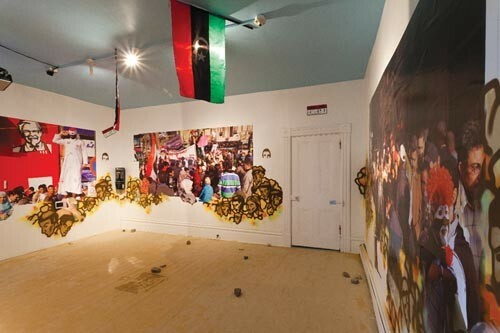 This piece, included in Sites of Passage at the Mattress Factory Annex Gallery, is all the more intriguing in light of the fact that the Occupy Wall Street movement took its cues from the occupation of Tahrir Square, in Cairo, Egypt. Begun in North Africa, the Arab Spring inspired street protests and occupations in "Western" nations including Israel and the United States, and in Europe. Sites of Passage, co-curated by Tavia La Follette and Katherine Talcott, is a timely exhibition. Begun as a workshop between artists in the U.S. and Egypt, it serendipitously took place near Cairo during the initial events of the Egyptian Revolution. Some of the work that emerged from the workshop is on display in the exhibition, but a key element of the project is a virtual lab that bypasses physical borders. Designed as a tunnel through which artists in the U.S. and Egypt can continue to communicate and experiment, the exhibition brings some of these collaborations into the physical space of the exhibition. On the top floor of the Annex is an installation that symbolically recreates Tahrir Square with video, sound and photographic documentation. This collaborative piece created by Emily Laychack, called "Tahrir2," also incorporates images and audio from the Wisconsin protests that took place earlier in the year. Public space is under scrutiny these days, as street mobilizations and tent camps continue to spring up around the globe. 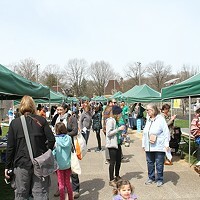 The occupation of parks and squares reiterates the fact that physical spaces are still necessary forums for airing grievances, and that the freedom to assemble is a principal tenet of democracy. While some of these spaces are actually private, such as Zuccotti Park in New York City, and Pittsburgh's BNY Mellon Green park, they are a great reminder of what democracy looks like. "Tahrir2" celebrates the use of public space as an instrument of change and a crucial indicator of democracy in action. Democracy is most often hard-won, and each nation must struggle to create its own version. Inevitably, nationhood itself is a deeply complex topic, particularly when it comes to borders. At the entrance to Sites of Passage is another piece by Al Fadni called "Passport Agency." An Egyptian-born Sudanese artist, Al Fadni is interested in nationality, identity and statelessness. His installation was inspired by the newly separated Sudan and by the U.S. visa process. (Incidentally, none of the Egyptian artists involved in the exhibition were able to get visas to come to the U.S.) Here, visitors can pick up a mock passport that says, "This document is valid in all imaginary countries and territories of the known and unknown worlds." Sharing the first floor is an installation called "Over My Dead Body," which includes graphics by Noha Redwan, audio by Holly Thuma, editing by Mark Bellaire and graffiti by Matt J. Hunter. Redwan designed this piece to resemble a subway as a metaphor for the struggle against former Egyptian President Mubarak. Redwan also has a video piece in an upstairs gallery, but video is a new medium for the Egyptian artists, and so the work included by U.S. artists is more adept. Hyla Willis' video installation "Grenadine" is a meditation on conquest that uses the pomegranate as a complex metaphor for both integration and invasion. Andrew Ellis Johnson's video installation "Descension" has viewers recline on pillows to watch a ceiling-mounted monitor that shows a bug's-eye view of camels eating. This placid scene is a reminder that the everyday and the extraordinary happen simultaneously. Susanne Slavick also uses animals to contemplate the revolution. Hand-painted onto her digital prints of a destroyed government building in Alexandria are ibises that function as symbolic protectors of a burgeoning democracy. Many of the Egyptian artists rely on words rather than images to convey messages of hope for their country. 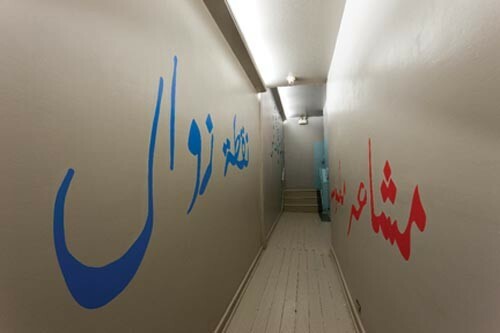 Arabic phrases designed by Mostafa Sleem cover the walls of the stairwell and hallway proclaiming "The Power of Now" and "Tangible Feelings." Animating these dictums is "Soul of Egypt," an audio piece by Asmaa Ezzat that plays Azaan calls to prayer and Coptic Christian hymns as an expression of a unified Egypt. And Hend Samir transforms an everyday conversation about comfort food and revolution into a poetic discourse in her installation "Macaroni Harmony." Overall, Sites of Passage offers a space to reflect on the auspicious events of the past year, and on the global dynamics of changing political landscape.